The Kings rookie looked anything but while setting a new career-high scoring mark on Monday. Marvin Bagley III did that last night. In case you haven’t seen — how could you not? — No. 35 finished what could be the Dunk of the Season. Running the break, Yogi Ferrell finds Bagley with a pass just below the rim, but as we know, nothing is out of range for the former Blue Devils star. The jam finished No. 1 on SportsCenter’s Top 10 List, and deservedly so. 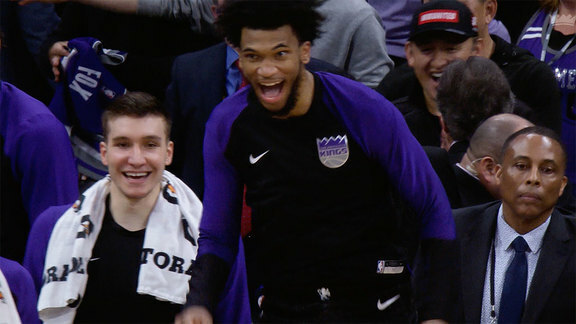 The finish brought Golden 1 Center to its feet, something Sactown is getting used to on a nightly basis. In addition to the slam, MBIII finished with a career-high scoring mark, dropping 24 points to go along with 12 rebounds and four assists. Catch Bags and the Kings on Wednesday as they host James Harden and the Houston Rockets.